It was summer vacation between my junior and senior years in college, and I spent it all working at a lead and zinc refining plant. 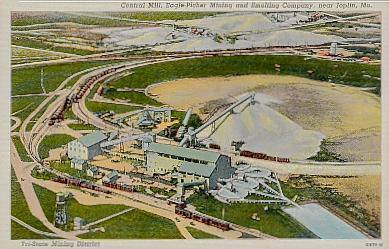 The facility, long since bulldozed into oblivion, was owned and operated by the Eagle Picher Company. It was located on the outskirts of Galena, Kansas along a stretch of the original Route 66. The summer recruits were assigned to various duties, all dangerous, all dirty, most involving hard work. I escaped from some of the hard work�but from none of the danger�by driving a payloader, a tractor of sorts with rear wheels as high as my shoulders and a big hydraulic scooper in front. I'd never driven one�or even seen one up close�before signing on at Eagle Picher, but this motorized scooper became virtually my own from the first day of my three-month stint at the Galena plant. The assignment was no accident. It was a result of a lesson I'd learned many times over from my dad. On many different occasions�in school, in Boy Scouts, and especially in the workplace� my dad would tell me, "Never assume that the next guy knows more than you do." (In later years, I came to believe that he'd learned that lesson the hard way--by falling behind because of making just such an assumption.) On that first day of work, the foreman lined up the new summer help and told us that we were expected to work hard. Then he asked, "Can anyone drive that payloader." I could have held back�to see if anyone there actually did know how to drive it. But I could almost feel a fatherly stare from behind. "Yeah, I can." I didn't know how user-unfriendly that piece of machinery might be, but I assumed it was designed to be driven. And driving it would probably be a lot easier than the work the rest of the summer recruits were about to be given. The payloader had an ignition switch, starter, accelerator, clutch, brake, and a few extracurricular levers. For the most part, learning by doing was a winning strategy. So, before the foreman had a chance to wonder about my payloading abilities, I actually could drive the thing. It wasn't Sunday driving. I was assigned to the plant's basement, a cavernous area used to store junk-grade zinc oxide�the residue from some refining process at a distant plant. A fresh shipment of the zinc oxide came in by train every few days. This stuff had a consistency somewhere between face powder and gun powder and was always intensely hot, even after its long train ride. You could poke a piece of cardboard into the oxide and then pull it out and watch it blaze. And for some reason, most batches of oxide were full of debris�scraps of metal and other charred and unidentifiable fragments of something. The foreman warned me, "When you're driving in the oxide, don't stop. The tires can't take the heat." "And if you have a load of oxide in your shovel," he told me, "be careful not to raise it too high. Your gas tank is right there between you and the shovel." Be careful? What was I to do? Hold my cap over the top of the tank? It was something to think about, but as things turned out, the gas tank was the least of my problems. The oxide was hauled from the plant's rail yard to the basement entryway by a dump truck. My job was to put the stuff inside with the payloader. The basement, probably 100 feet by 200 feet, had only that one entrance. When it was empty, I would have to drive 150 feet or so from the entryway to the far end hauling or pushing zinc oxide. (Pushing was easier, but each trip across the basement left a powdery wake�which would quickly built up and require still more pushing.) Under ordinary conditions, I could have a dump-truck load of oxide packed away before the truck was back to dump some more. It typically took a whole shift�eight hours�for the driver and me to haul and pack away a hopper-car load. The pace of the work was pretty much set by the rhythm of the dump-truck driver. At the beginning of my first shift in the basement, I was struck by how well lit this windowless work area was. There were bulbs�200 watts each�in a matrix that spanned the length and width of the basement. There was a matrix of support pillars, too. An uninterrupted row of bulbs alternated with a row of bulbs interrupted by support pillars. I soon learned that the bright light was no luxury. Before the first dump-truck load was put in its place at the end of the basement, the oxide in the air cut visibility to near zero. I found myself using the trail of bulbs to avoid pillars and as navigation aids. I'd dump a shovel full, spin around, drive twelve bulbs to the east, turn left, and drive six bulbs to the north. If I hadn't lost count, I could then see daylight from the basement entryway. I would usually have time to drive the payloader out of the basement, change the air filter in my face mask, knock the oxide out of my hair, and let my tires cool down before the dump truck arrived with the next load. On-the-job training taught me to use the old air filter to clean the oxide off my spark plug wires. If I let it accumulate for too long, the plugs would short out. Sometimes things didn't go so smoothly. My problems began when I discovered at the beginning of a midsummer shift that the brakes were out on the payloader. I went topside and reported the problem to the foreman. He told me he'd already submitted a work order to the repair shop but that the mechanics were covered up at least until the next day. He told me to "make do" until then. Leaving the foreman's office, I was told by an old veteran of the basement�who was now driving a fork lift on the ground floor�that I could use the shovel as a brake. "If you've got an empty shovel, just drop it in the oxide. That'll stop you." I could see how it would. "And if you've got a full load, press it against the ceiling." But then, showing some concern for my safety, he said, "Watch that gas tank." On returning to the basement, I soon realized that whoever drove the payloader on the night shift (He was taking oxide out for use somewhere in the plant) had used that very tactic. The ceiling did function like a big brake shoe, but brake shoes are not typically lined with 200-watt light bulbs. About half the bulbs between the entryway and the nearest pile of oxide were gone�which meant that my navigation system was seriously degraded and that I was driving around in hot zinc oxide laced with broken glass. Still, I was able to "make do." The oxide got packed away. The next day, the repair shop was still covered up and, worse, the dump-truck driver was one Ralph Dousette, a long-time employee whose reputation for hard work was well known throughout the plant. Ralph was no ordinary dump-truck driver. You'd think he lived to work rather than worked to live. I had already heard the story of how he had worked a deal with the foreman. If it normally took one shift to unload one hopper car, then why couldn't Ralph unload the hopper car at his own pace and call it a shift? The foreman had shrugged consent. I discovered later that after Ralph did eight hours work in less than five hours, he went home and worked some more tending to his fields. When I reported to the basement for work at eight o'clock, there were already four or five dump-truck loads in front of the entryway. I knew right then that it was Ralph behind the wheel�and that I had better get to work. He had started his shift at daybreak, but by mid morning, I was beginning to catch up. There wasn't any time to change any filters, though. And I'd snuffed out a few more of those bulbs and had got lost in dense oxide a time or two. At one point, I got complete turned around and was looking along the south wall for the entryway. It was only the thundering sound of Ralph dumping still another load that allowed me to set a better course. Ralph didn't stop until the hopper car was empty�just before noon. After dumping his last load at the basement entryway, he shut his own engine off so he could listen for mine. What he heard was a badly faltering payloader engine. The oxide build-up had caused my plugs to go into their hit-again/miss-again mode. I was headed towards the entryway guided by the faint hint of daylight. When even the faint hint disappeared, I realized that I was on a collision course with one of those support pillars. To avoid stirring up even more oxide, I raised my empty shovel to the ceiling to stop the payloader. I didn't see the light socket. The bulb had already been taken out on an earlier pass. On this pass, I took out the electrical conduit to which the socket was attached. And then, for the first time since my shift began, I saw�and heard�lots of light. Streaking light. I could no longer even hope to see the entryway, but with each bluish flash of light, I could see just how much electrical hardware was draped over my shovel. The eerie noise that accompanied the light caused me not to realize for some time that I no longer heard my own engine. I did realize that there was little to be gained in trying to clean the spark plug wires at that point. The sights and sounds of the electrical show were surpassed in a few minutes�thought it seemed like an hour�by the smell of burning rubber. I knew the tires were going to blow. But I wasn't anxious to add the smell of burning shoe leather to the mix. I stayed put. Fortunately, Ralph had seen the electrical show, too, and had gone for help. After a sustained encore, the flashing and the noises ended abruptly and the oxide began to settle. Thoughts about my volunteering to drive the payloader�along with a thousand or two other thoughts�rushed through my head. The silence was eventually broken by the sound of a engine. I could make out the silhouette of a forklift between me and the entryway. It was the old veteran of the basement. He raised his fork-and-pallet to meet my shovel. For some reason�maybe for closure�I switched off my ignition and pulled out the key. I climbed over my gas tank, around the electrical hardware, and onto the pallet. The ride to the entryway had the feel of an eternal serenity about it. And the emergence into bright daylight was punctuated by the sound of an exploding tire. The foreman eventually showed up to look for the cause of the power outage and to see if there was anything that required his attention. The forklift driver, having been appropriately thanked, had already headed back up the ramp to the ground floor. Ralph told the foreman that he was finished with his shift and was ready to go home. The foreman saw I had the keys to the payloader. He told me to drop them off at the repair shop on my way to the showers. And he said that if Ralph could call it a shift, then he guessed I could, too. I thanked him and caught a ride with Ralph to the change house. The conversation during our short hop was about the work that he intended to do when he got home.